I was lucky enough to get tickets for Wynton Marsalis & JLCO last night (17th June 2010) at the Barbican Theatre, London. I’ve seen this outfit now on 3 occassions and am constantly wowed by their skills and panache. Last nights gig was entitled ‘Swinging Beginnings’ and was part of a series of concerts and events with the JLCO in London. They have been given a residency at the Barbican Theatre and have used the oppurtunity to roll out a series of workshops in London to help kids with Jazz programs and education. Performing before the main event last night were a youth jazz orchestra from East London who had been given the ‘JLCO treatment’, it was clear to see the expert help had inspired the players and they will have grown in confidence from the chance to play on such a great night. It’s this kind of outreach from Marsalis and co. that sets apart their contribution to the jazz scene and total adaptability within it. The ‘Swinging Beginnings’ concert was as I mentioned part of a host of concerts including ‘BeBop and Beyond’ and ‘Big Band Brittania’ nights in the next few days. As the title implies the ‘Swinging Beginnings’ session was a musical trip and reference back to the 20’s, 30’s and early 40’s. The band played through some well known and also lesser known numbers from such names as Jelly Roll Morton, Don Redman, Eddie Durham, Fletcher Henderson, Duke Ellington and pleasingly (for the author!) even a nod in Count Basies direction with a nice arrangement of Blue and Sentimental. The more well versed readers out there will probably start to feel this has all the signs of just another Big Band playing dated music that bares no interest to us modern jazz cats…this is a dangerous assumption and mis-understands the quality of the musicians on show. Whilst this was the closest I will have got to hearing Ellingtons band in person, it was also unmistakeably Marsalis and his JLCO and their sound. 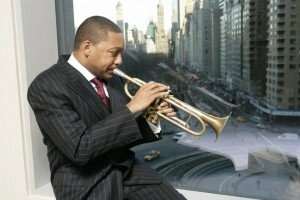 This ability to blend, adapt and yet keep the bands unique style and sound is in my belief one of Marsalis’ greatest achievements. The sound was not dated but still in keeping with the style as it was written and intended to be performed. This adaptive quality of the JLCO is probably strengthened due to the consistency of their lineup. Since I first saw them around 8 years ago, only 3 or possibly 4 of the members have changed. Happily one of the changes for us Brits is the inclusion of Elliot Mason on Trombone, originally from Norwich, this accomplished Trombonist has made a name for himself on the scene and is now seemingly an ever present in the JLCO. Also representing the UK was the great Joe Temperley on Bass Clt / Bari Sax, also an ever present in JLCO he is also the only member to have played with the great Ellington himself. The ‘front line’ sax section is annoyingly good (speaking as a middle of the road reed player) and voices itself as one coherent section, noteably Victor Goines got a good workout on the Tenor / Clt chair. I popped into Dawkes with a couple of instruments for routine repair last Tuesday. As always I got chatting with Sam about this and that when he suddenly asked me if I followed the football? I said yes, but not particularly seriously (cricket, however is a different matter!) 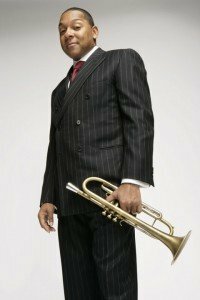 Sam then offered me 2 tickets for Friday nights concert at the Barbican with the LCJO & Wynton Marsalis, I practically bit his hand off and in view of what happened in the football I definitely got the better deal.